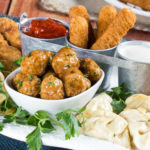 When the weather starts to cool down, it seems like everyone wants to eat comfort foods. Sure, we like grilled cheese year-round – but isn’t it just prefect with a big, warm bowl of tomato soup? We have a lot of great grilled cheese sandwich recipes, but there’s no doubt that you should start with our Ultimate Grilled Cheese Sandwich. 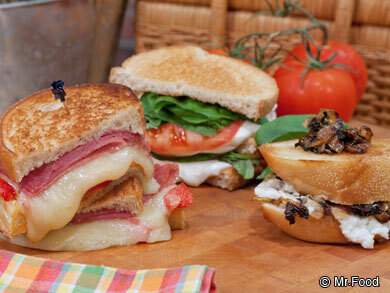 This is the holy grail when it comes to grilled cheese at the Mr. Food Test Kitchen! And it’s got a secret ingredient that will forever change your life if you’ve never used it: Cream cheese! Yep, mix that with some mayo and then add your cheeses to it, and you will indeed experience the ultimate in rich and cheesy goodness. The best part about this recipe, and really any grilled cheese sandwich recipe, is that you can easily make it your own by using your own favorite cheeses. Why not try a spicy pepper Jack cheese, or an extra-creamy piece of Brie? If you like classic American, by all means, stick with that! Caprese-Style Grilled Cheese: The colorful and fresh ingredients we’d find in an Italian caprese salad are layered and melted together in this novel Caprese-Style Grilled Cheese sandwich that’s sure to become a favorite at your house! 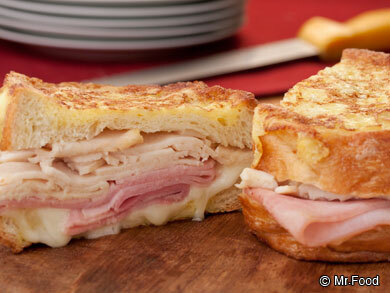 Monte Cristo Sandwiches : This easy recipe for melty skillet turkey, ham and cheese Monte Cristo Sandwiches is the perfect one for a quick weeknight supper of grilled sandwiches. Grilled Goat Cheese Sandwiches: You’ll love the combination of tangy goat cheese and sweet caramelized onions in this grown-up grilled cheese sandwich. Grilled Goat Cheese Sandwiches make for an exciting change-of-pace option. Italian Antipasto Grilled Cheese: This Italian-Antipasto Grilled Cheese sandwich has all the tastes of a favorite Italian restaurant-style salad, in a warmy melty sandwich. Grilled Pizza Sandwiches: Move over grilled cheese, and say hello to Grilled Pizza Sandwiches – they’re a pepperoni lover’s dream! 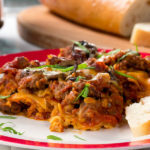 You’ll want to buy a loaf of sturdy bread to contain all the ooey-gooey pizza mixture. Easy Arepas: What’s an arepa? It’s melted cheese sandwiched between two crispy corn pancakes -kind of like the Mexican version of a grilled cheese sandwich. Well, I finally figured out an easy way to prepare them! Grilled Chicken & Cheese Sandwiches: We’ve heartied this grilled cheese sandwich up with flavorful pre-cooked rotisserie chicken and a few other tasty textures and tastes. Grilled Chicken ‘n’ Cheese Sandwiches turn a simple sandwich into a filling meal. Bacon & Egg Breakfast Grilled Cheese: This doubly good breakfast sandwich combines a load of favorites all in one. Imagine starting your day off with a hearty and melty Bacon and Egg Breakfast Grilled Cheese! Farmhouse Ham & Cheese Bake: Grilled cheese in a casserole dish! These hot ‘n’ hearty all-in-one pan Farmhouse Ham and Cheese Bake sandwiches will earn you a gold medal every time you make them. How do you like to make your grilled cheese? Can’t wait to hear your answers!